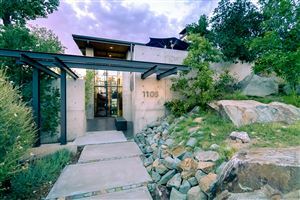 Beautiful open floor plan, light and bright, gleaming hardwood floors throughout, porcelain/ceramic tile in kitchen, baths, utility and studio/office. Maple cabinets & quartz countertops with ceramic tile backsplash and pendant/recessed lighting in kitchen. Double pane windows & newer roof. 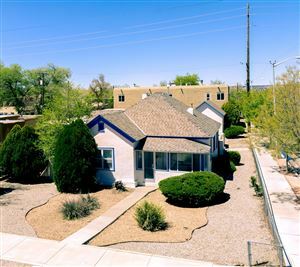 Large bedrooms with ceiling fans, main bath & utility room, great for pets or craft projects. Separate office/studio/workout room heated and cooled. Timed front and rear irrigation and low maintenance landscaping with large rear deck for outdoor enjoyment. Circle drive for ample off street parking in addition to a double garage finished with some shelving. Convenient access to UNM, CNM, Nob Hill entertainment & shopping, airport and freeway & nearby Altura Park.